Is bullying really that bad? Why do some people just watch it happening? How do you know if it is bullying or strong management? What kind of leaders are able to create positive working environments? The effects of bullying on organisations and individuals can be devastating and can adversely affect both the workers themselves and the productivity of the organisation that they work for. This book explores the impact of bullying from the perspective of both the employee and the organisation in which they work. In addition to describing the negative outcome of bullying, Workplace Bullying also looks at ways to promote resilience and the opportunity for growth and learning to take place. underlying causes and future considerations. 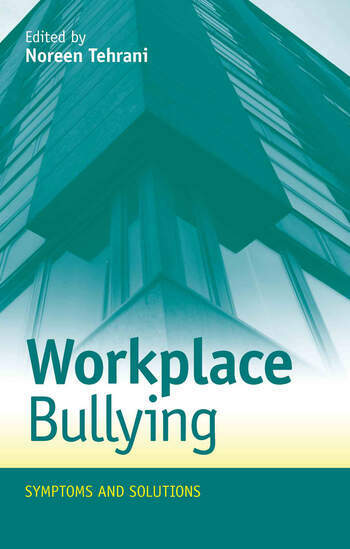 Workplace Bullying is essential reading for anyone with responsibility to help and support workers involved in bullying as a victim, supporter, or investigator. It offers organisations a chance to create an environment that will not only build a more resilient workforce, providing appropriate and effective interventions, but also provides solutions that will lead to the possibility of individual and organisational growth and development. Tehrani, Introduction to Workplace Bullying. Part I: The Impact and Symptoms. Hogh, Mikkelsen, Hansen, The Impact of Bullying on Workers. Tehrani, Bullying and Post-Traumatic Stress. Vaughan, Ya’makasi or the Art of Displacement in the Corporate World: A Target’s Perspective on the Impact of Workplace Bullying. Soares, When Darkness Comes: Workplace Bullying and Suicidal Ideation. Bloch, How Witnesses Contribute to Bullying in the Workplace. Tehrani, Popovic, Compassion Fatigue in Human Resource Professionals. Part II: Individual Interventions. Dunn, Narrative Approaches or the Alternative Story. Crawshaw, Coaching Abrasive Leaders: Contradictory Tales of the Big Bad Wolf. Tehrani, An Integrated Counselling Approach. Hirgoyen, Healing the Wounded Soul. Part III: Organisational Interventions. Hubert, Support, Informing and Aftercare by Co-workers in the Netherlands: The Role of the Confidential Supporter. Dix, Davey, Latreille, Bullying and Harassment at Work: Acas Solutions. Vartia, Tehrani, Addressing Bullying in the Workplace. León-Pérez, Arenas, Griggs, Effectiveness of Conflict Management Training to Prevent Workplace Bullying. Part IV: Other Wisdoms. Tehrani, Beyond the Drama of Conflict. Bloom, Building Resilient Workers and Organisations: The Sanctuary® Model of Organisational Change. Liefooghi, Vulnerable Selves, Disciplining Others. Noreen Tehrani is a chartered occupational, counselling and health psychologist. She is Managing Director of Noreen Tehrani Associates.